Last Saturday marked the grand opening of a new bar in the former Katerina's space, High-Hat Club. The north-side spot has a few signature cocktails, a small menu of "Creole-Italian" food, and hopes to hold its own as a new performance venue in a market with lots of them. The bar was only three days old when I stopped in, but it already felt familiar, filled with soon-to-be regulars receiving hearty hellos from the owner, Michael Polino. The Green Mill vet (who will still be seen slinging drinks over there from time to time) channeled the Mill's historic ambiance; there's a vintage feel to the bar that that makes it a fitting setting for the cabaret-style comedy showcase Sadsacks and Wisecracks, the spot's first original show. 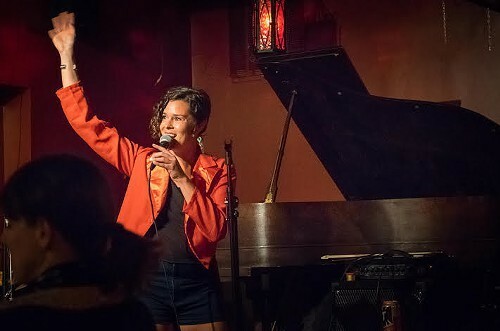 Host Natalie Jose even came out in a bright red tailcoat and made an unofficial promise to one day lay across the top of the bar's grand piano. If the first night's lineup was any indication of what's to come, the venue has the potential to be one of those great places in town to catch comics before they hit it big. The night featured a reading from playwright Caitlin Parrish, hilarious characters from Julia Weiss and Kate James, and a closing set from heavy-hitter Brian Babylon, a practice run for a showcase in New York that could land him a spot on a Comedy Central show. Maybe the night’s most delightful moment was during Ian Abramson's set; he's another comic soon making the pilgrimage to NYC. He used giant cue cards to prompt the audience to reenact scenes from Pulp Fiction and The Notebook with him, ending with the entire crowd reciting an Academy Award acceptance speech he penned. The space's intimate setting forced everyone to get on board—it's hard to not do a bit when the comic is five feet in front of you, staring you right in the eyes. The laughs were punctuated with musical acts like a cappella group Faces for Radio and comedic cabaret singer Bill Larkin, with bluesy local band Mutts closing out the night by standing on the piano and stomping across the keys. While this particular show will only be once a week, but most nights at High-Hat should be just as fun. Comics will be booked to host jazz and rock shows, continuing the mix of comedy and music. And along with Sadsacks and Wisecracks, the venue will serve as a permanent home to Sean Flannery's Blackout Diaries which has been on hiatus since July; it starts up again this Saturday at 8 PM. Perhaps it's a little hasty to judge a place that hasn't even been open a week, but after pulling off their first show without a hitch, I'd say they're going to do just fine. Sadsacks and Wisecracks, Mondays 8 PM, High-Hat Club, 1920 W. Irving Park, highhat.club, $5.